When Joshua Russell performed Justin Elie’s Tropical Fantasy with the Dubuque Symphony Orchestra, it was the first time the work had been heard outside of Haiti in 80 years. Described as a “Haitian Rhapsody in Blue,” the work was premiered in 1930, but the composer died suddenly before it was published. His widow, who mourned his death through the remainder of her life, locked his scores away in a trunk in her house in Haiti. 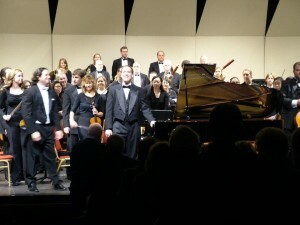 Joshua Russell was able to acquire the hand-written orchestra parts and reconstructed the score and parts that were used for this performance. Joshua Russell is also available to perform a solo recital of Haitian piano music from his latest CD, Valses to Voodoo: The Piano Music of Haitian Composer Ludovic Lamothe. This recording is part of his effort to help rebuild Haiti’s primary music school that was destroyed in the January 2010 earthquake. Half of the proceeds from this recording directly benefit the rebuilding process. 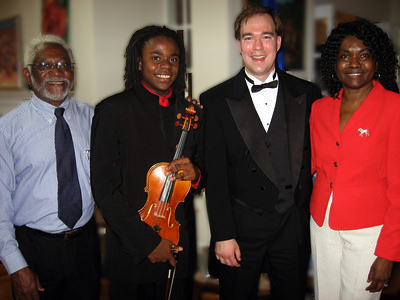 Joshua has currently raised nearly $10,000 in monetary and instrument donations for the school. Below you will find a video describing Joshua’s Haitian music project. Click Here to Purchase the CD.